These brand new and gorgeous Jars of Incense are amazing! Seriously, guys. Get ready. One beautiful glass jar contains 100 bambooless high-quality Japanese incense sticks. The scents are all so different yet they're all incredibly rich and inviting. Each jar features a lid that doubles as an Incense Holder with different bohemian patterns for each scent. So. Clever. 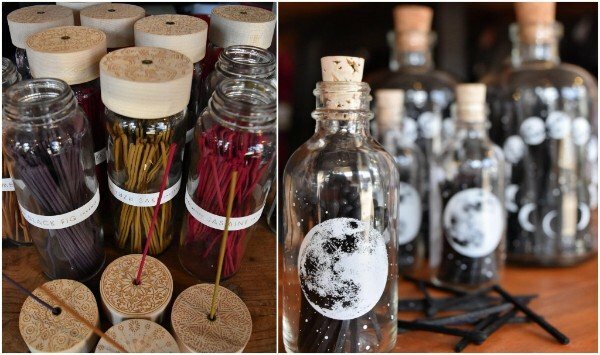 To top off this magical burning experience we have some lovely Bottles of Matches featuring the moon and alchemy symbols. The bottles have their own "strike" strip right on the side for easy lighting. They're so pretty you'll want to keep them out on your shelf at all times. We can't wait to take home some incense and matches, put on a Fleetwood Mac album and relax. Doesn't that sound great? You too can get in on this vibe by ordering your favorite scent here.